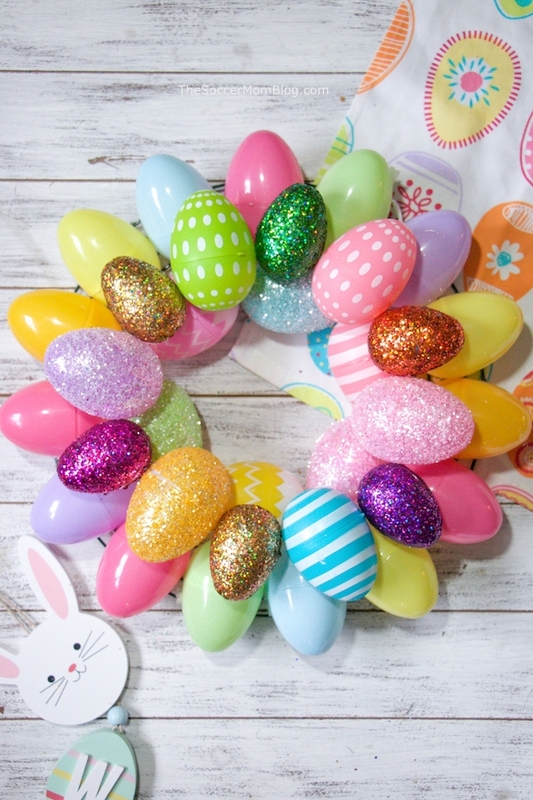 10 Minute Easter Egg Wreath - 2 Cute & Easy Designs! 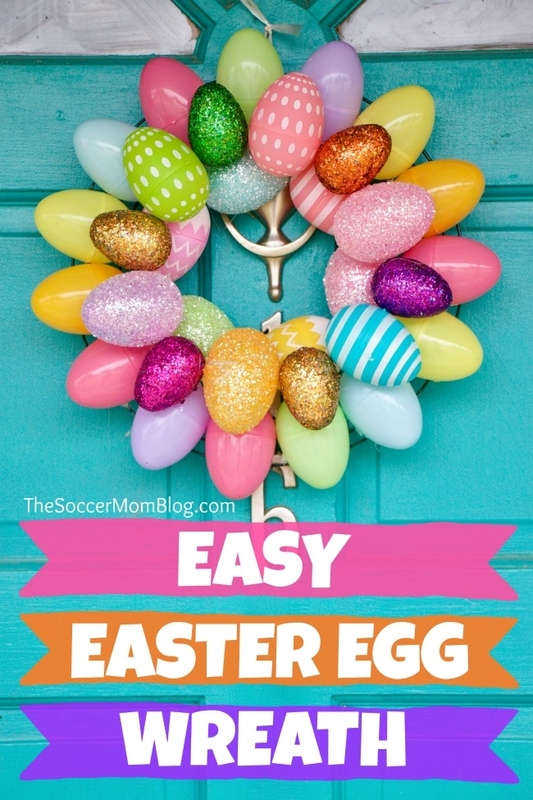 Home » Crafts » 10 Minute Easter Egg Wreath – 2 Cute & Easy Designs! 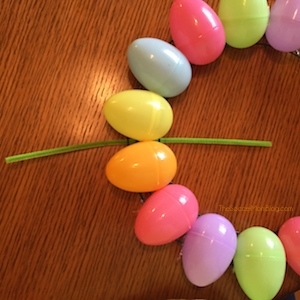 A quick & easy Easter Egg Wreath that anyone can make! 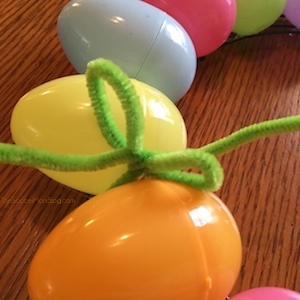 Add a festive touch to your front doors in minutes with two different versions of this Easter craft. 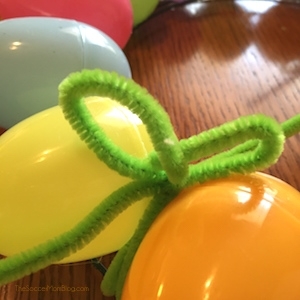 Such a cute & clever way to use those extra plastic Easter eggs that you might have around the house or in your holiday storage! I think I’ve mentioned before that I’m not exactly a craft whiz. However, while on a walk this morning with my youngest daughter, I found inspiration for this Easter Egg Wreath! One of our neighbors had a festive Easter wreath on their front door. 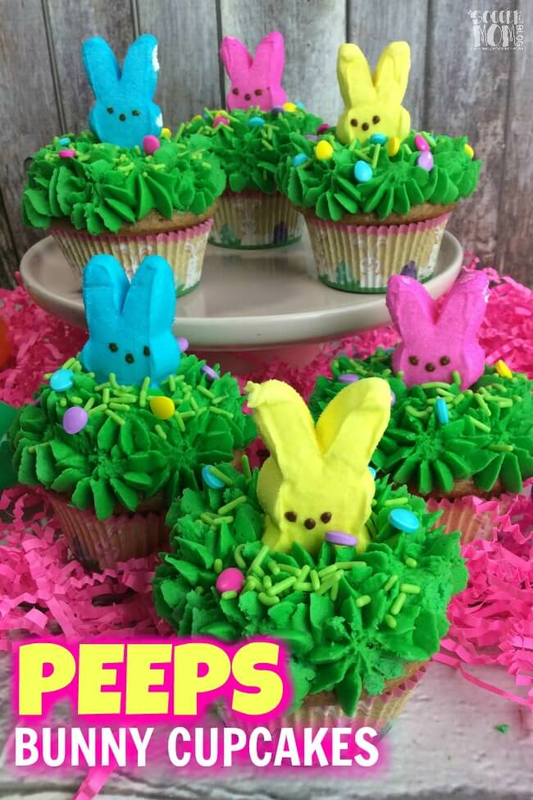 I hang wreaths for every occasion: Christmas, Halloween, 4th of July, etc., but I didn’t have one for Easter! 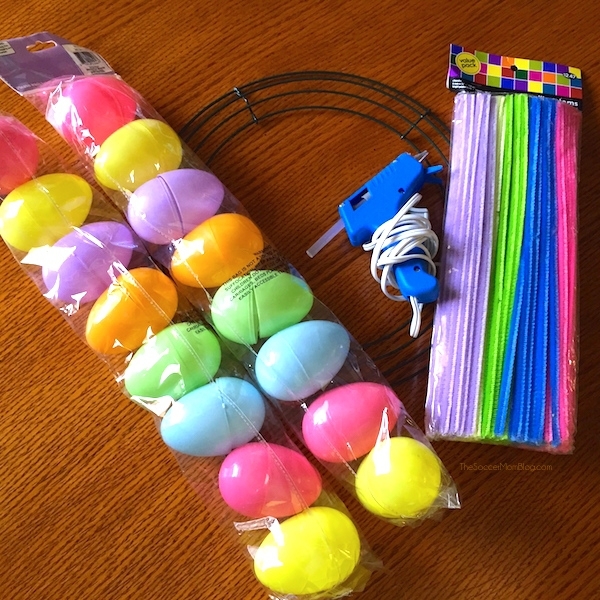 Then I remembered a bunch of extra plastic eggs my mother-in-law had brought over last year and I had stuffed in the hall closet. And for some reason we had a couple metal wreath frames in the closet too. 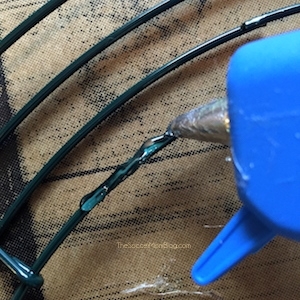 I started getting more and more excited as I thought about it — I had extra pastel pipe cleaners…and a hot glue gun — surely I could put something together! 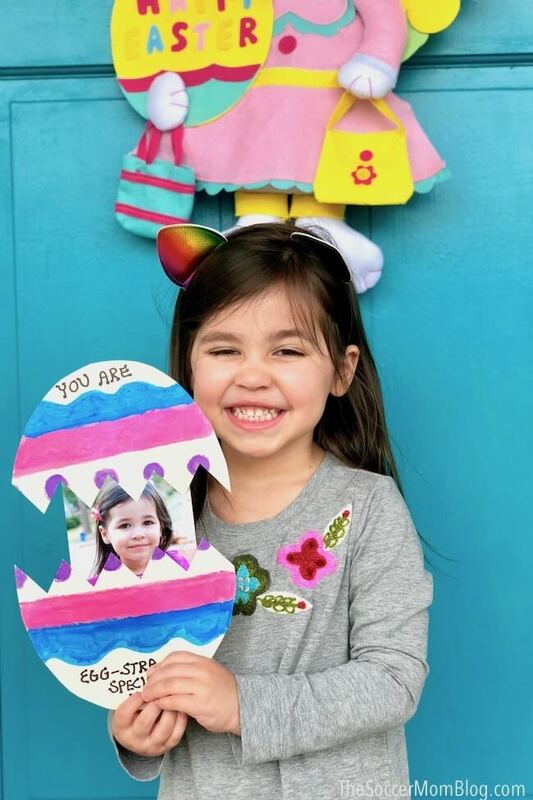 UPDATE 2019: We made a second version of our Easter Egg Wreath, just as easy as the first, but more 3-dimensional in style. We’ll show you how to make both! 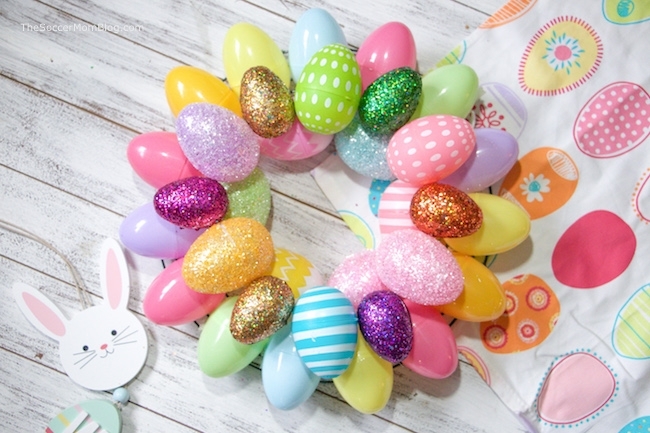 I’ve included shop-able ad links for your convenience in finding the items used to create this Easter egg wreath; read our disclosure policy here. First, watch our video tutorial (this is for version #2). 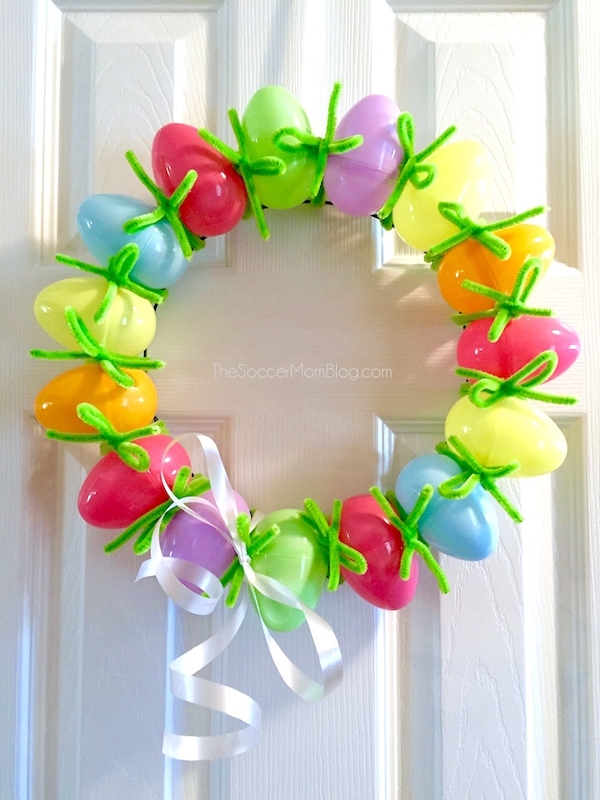 Below the video we have step-by-step instructions how to make a wreath with plastic Easter eggs two different ways. 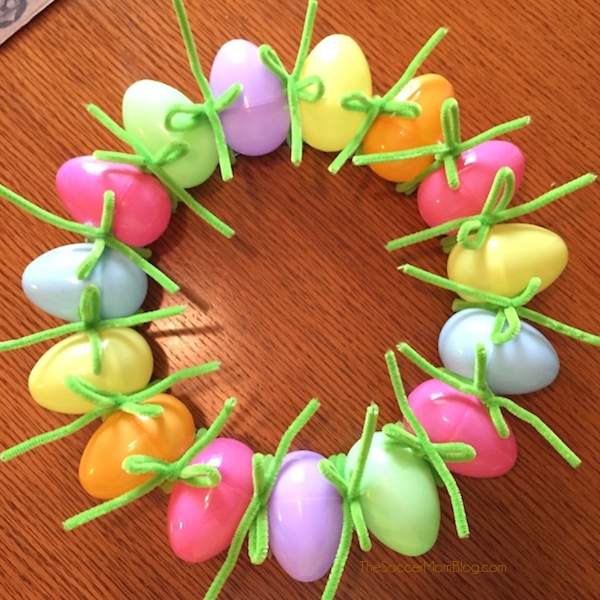 First, I glued the eggs to the wreath frame with the widest part of the eggs touching each other and the pointy side facing outwards. 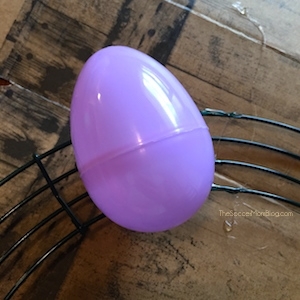 TIP: Before I glued anything, I arranged the eggs in a pattern so I wouldn’t accidentally end up with two of the same color next to each other — I had a limited number of eggs since I was only using what I found in storage. 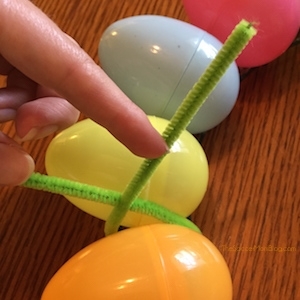 Slide one pipe cleaner under the wreath. 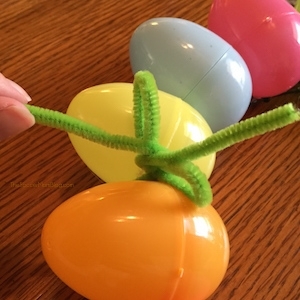 Cross the ends of pipe cleaner and twist twice to keep in place. 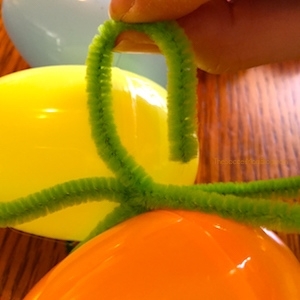 Slide a second pipe cleaner under the wreath and fasten the same way by twisting. Twist the first pipe cleaner over the ends of the bow to secure. Lastly, I trimmed the ends of the pipe cleaners so they didn’t stick out quite so far and tied on a ribbon bow for a finishing touch. 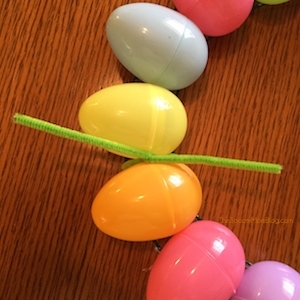 For the second version of our Easter Egg Wreath, you start with the simple wreath above, without the pipe cleaners. 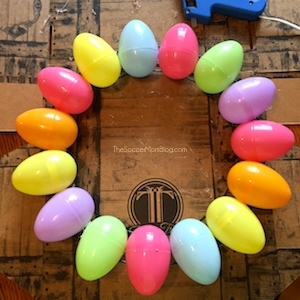 Next, you glue an inner ring of about 6 large eggs to your wreath. Lastly, glue a top layer of eggs, alternating between large and small eggs. 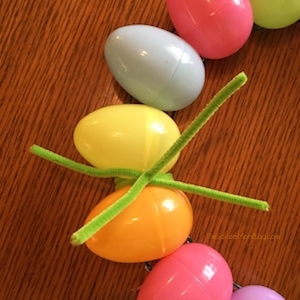 This is a more 3-dimensional Easter egg wreath, but it’s still just as simple to make! 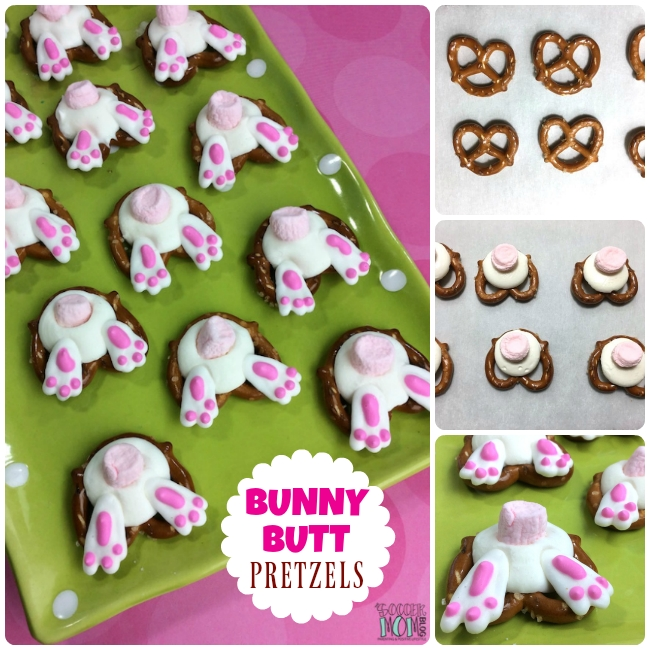 Such a fun Easter craft to make with the kids (just be sure to help or supervise with the glue gun). Update 1/2018 – We’ve had our Easter egg wreath for three years now and it still looks great! 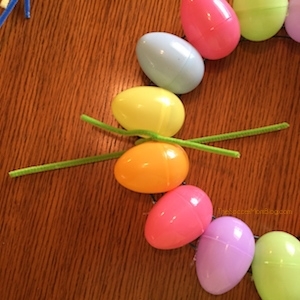 I’m impressed how well this craft held up over time – we use it every spring! Thanks! I was happy with it, especially for my first wreath!